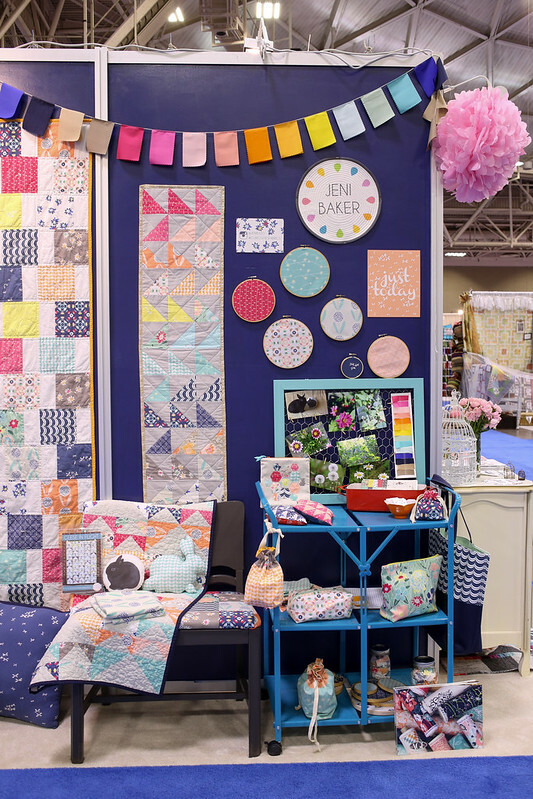 I can't believe it's already been nearly a month since Quilt Market! Time has absolutely flown by since then. 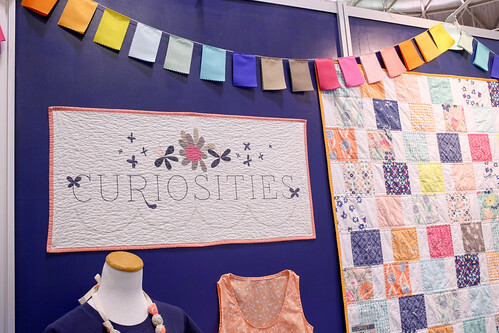 I have been preparing to be in Ohio for a week and a half, so a few things fell by the wayside, including posting about my Curiosities booth! Today I want to share some photos! I'll got into detail about the projects later this month. 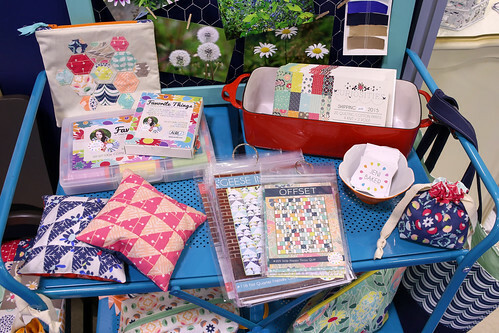 I had an exterior wall of the large Art Gallery Fabrics booth. It's really nice to be able to decorate a flat wall vs. a three dimensional booth. It was great being able to drive and bring my own furniture without having to worry about going to Ikea or bringing things in my suitcase. I wanted the projects to really pop, so I went with navy for the walls. I kept the projects sweet and simple. I felt that this best represented the cheerful, playful nature of the collection. Plus, with limited time and resources, it made the most sense anyways! Okay, let's just get to the photos! 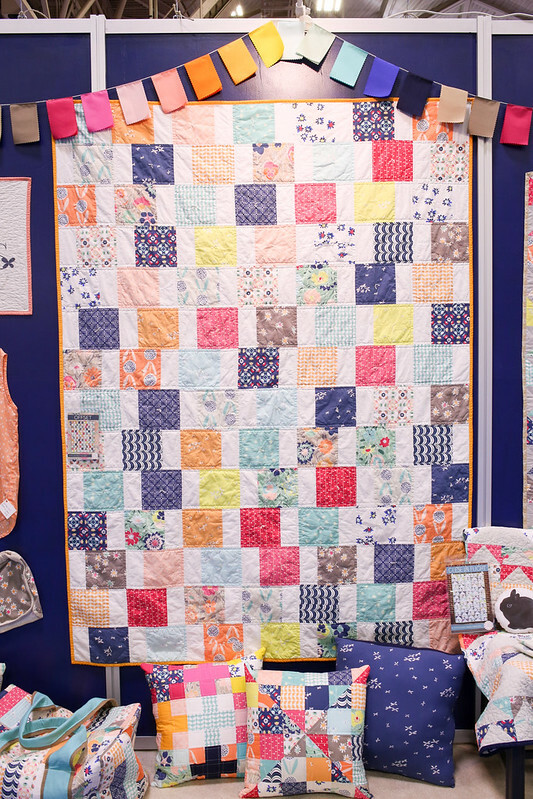 This section of the wall had more of the smaller projects, including my new quilted logo, some embroidery hoops, and a "Just Today" print I'll be sharing as a free download soon! 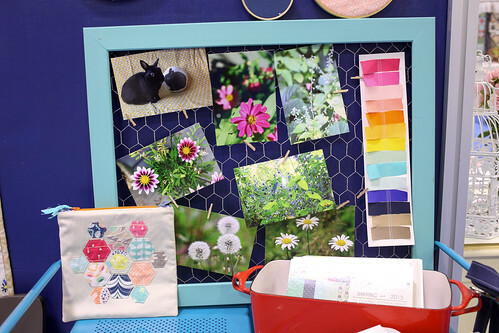 I made this inspiration board out of an old frame and some chicken wire. It was a fun project, and I have it hanging in our hallway now with other photos. For the booth I used it to display some inspiration photos, including the photo of George I used to create his print! You can find a tutorial for it here. A few more small projects, including a tiny drawstring bag! The pincushions will be a tutorial next month! A full shot of my new mini pattern, Offset. I quilted it my machine with some straight lines and then finished it up by tying in each square. George's pillow, and his friend! Also I made a baby version of Geese in Flight! 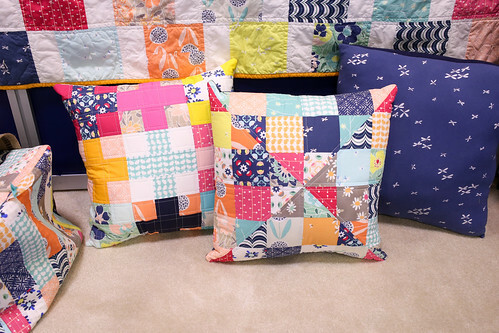 A couple of fun throw pillows, one using my Mystery Quilted Pillow Pattern, and even one made from knits! I used some of the knits from the collection for the simple t-shirt (which is a Scout Tee by Grainline Studio done in knit), and some City Gym Shorts. I also made a knit drawstring bag! 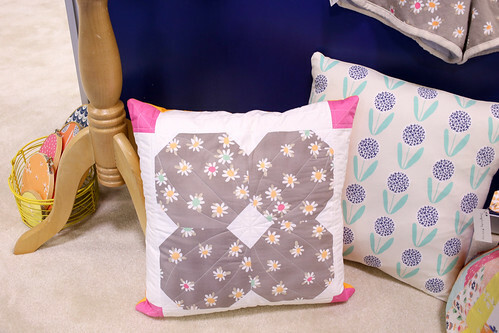 A sweet pillow made from a single block from my Florette pattern. 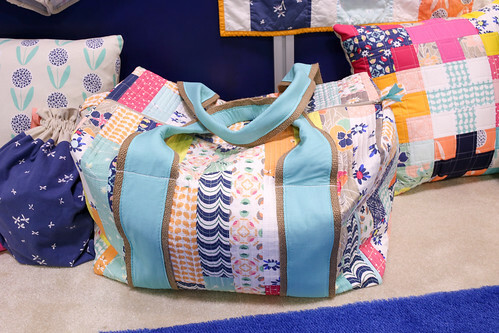 One of my favorite projects I made for the booth was this quilt-as-you-go duffle bag. I used Simplicity 2274. (You can also buy it as a PDF here.) I reviewed the pattern a few years back, here. I love it! Jeni, all of it! You did a great job! the navy wall was a fabulous choice! Everything looks so wonderful! I agree the navy was a great choice... it really makes everything else stand out so well. 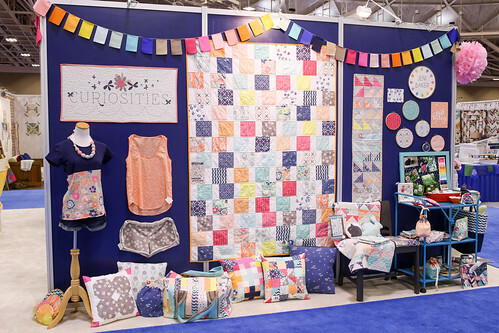 Love your booth! Navy was a really good choice, the projects are really standing out. They're so beautiful and I love all of them. And I really admire your quilted logo. It looks amazing! 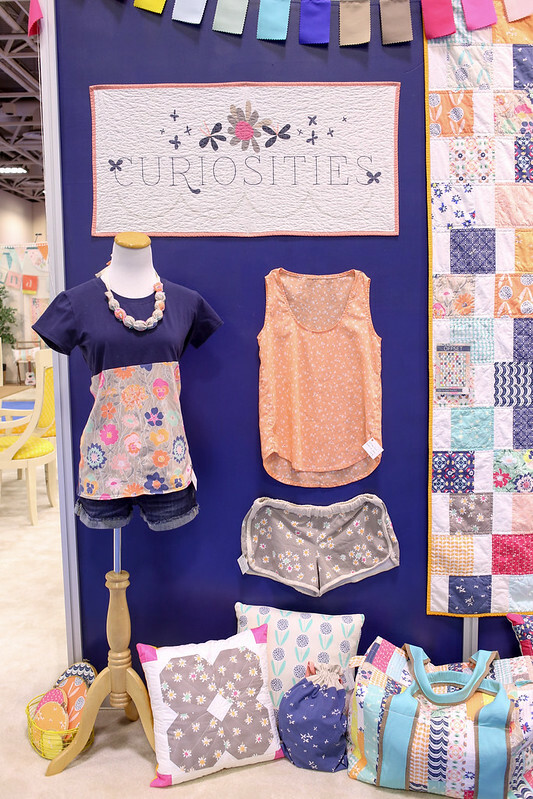 I love your new fabric line, Curiosities. Like the name, too. I want to make your Geese in Flight quilt and was wondering what you used for your solid? 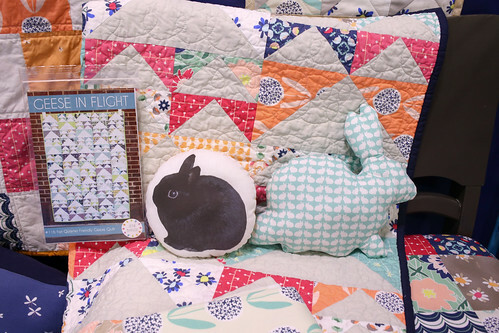 It gives the quilt a nice mellow look and I think that hire would be too stark. Thanks. Thanks! It's Pure Element Light Grey from Art Gallery! That blue wall really did make your display pop. That was a cool quilt as you go bag. Love all your projects and display.